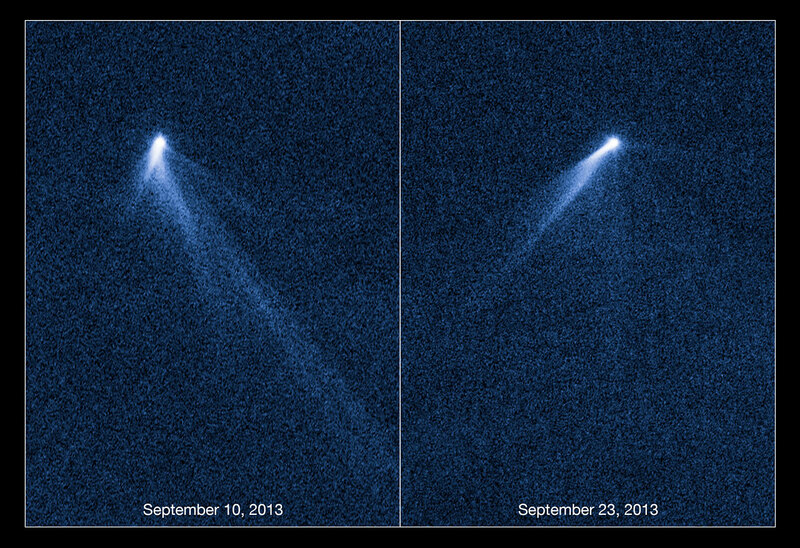 If you thought tails were just for comets and cats, this asteroid is about to prove you wrong. On August 27 astronomers spotted an unusually fuzzy looking object in survey images taken with the Pan-STARRS telescope in Hawaii. The multiple tails were discovered in Hubble images taken on September 10, 2013. When Hubble returned to the asteroid two weeks later, its appearance had totally changed — it looked as if the entire structure had swung around! While this object is on an asteroid-like orbit, it looks like a comet, and is sending out tails of dust into space. Because nothing like this has ever been seen before, astronomers are scratching their heads to find an adequate explanation for its mysterious appearance. One interpretation is that the asteroid’s rotation rate has increased to the point where dust is falling off the surface and escaping into space, where it is swept out into tails by the pressure of sunlight. According to this theory, the asteroid’s spin has been accelerated by the gentle push of sunlight. Based on an analysis of the tail structure, the object has ejected dust for at least five months. Careful modeling by team member Jessica Agarwal of the Max Planck Institute for Solar System Research in Lindau, Germany, showed that the tails could have been formed by a series of impulsive dust-ejection events. Radiation pressure from the Sun smears out the dust into streamers. The asteroid could possibly have been spun up to a high speed as pressure from the Sun’s light exerted a torque on the body. If the asteroid’s spin rate became fast enough, suggests lead investigator David Jewitt of UCLA, the asteroid’s weak gravity would no longer be able to hold it together. Dust might avalanche down towards the equator, and maybe shatter and fall off, eventually drifting into space to make a tail. So far, only a small fraction of the main mass, perhaps 100 to 1000 tons of dust, has been lost. The asteroid is thousands of times more massive, with a radius of up to 240 meters. Space… it’s like a box of chocolates, you never know what you’re gonna get. Previous Post Vesta’s Formation History? It’s Complicated. Coinciding or otherwise timely is the general uptick in comet brightness estimates and tail growth activity – i.e. expanding dust and ion tails. Mr.Sol’s recent series of magnetic anomaly’s and sun spots with highly energetic X-class flares must be key here? Sill hoping for a comet searing CME at ISON’s perihelion!